The Ikea Sundvik Crib is easy to assemble and it is not expensive. It's a standard crib that weighs in at 55 pounds. People who are looking to save money might want to give this baby crib a good look. If you were born 30 years or so ago, this may have been the type of baby crib you used. It has slats and is made simply with a sturdy construction. Typically this type of crib is long lasting. These types are often handed down from generation to generation. The only problem with handing down simple and standard cribs, like this one, is that you have to keep an eye on safety standards. The standards are constantly changing. For example, what is considered a safe distance in slats, changes as we know more about safety. Also, we now know that drop down crib sides are no longer considered safe. It is recommended to not buy used, old cribs at garage sales for this very reason. But, thankfully, this Ikea Sundvik Crib has met all of the 2017 crib standards. So if you do choose to buy this crib, you can purchase it without worrying about your baby's safety. If you are wanting a crib to move from room to room, then this crib may not be the one you want. 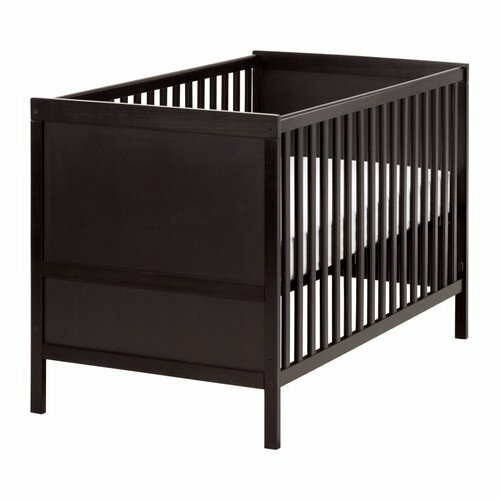 Standard type cribs such as this Ikea Sundvik Crib, are made to stay in one place. Standard cribs also lack extra features that some of the other cribs have. But, if you are wanting a sturdy crib to stay put in one room at an affordable price, then keep reading! I've researched what parents had to say about the Ikea Sundvik Crib and broke it down by topics. I hope that this helps you decide if this baby crib is right for you and your little one. Keep in mind that what is a disadvantage to one person, may not be a disadvantage to another. For example, if someone is evaluating this crib as a travel crib, then they most likely will not like it. But, if the buyer is wanting an easy to assemble crib that can stay put in a baby's room, then this crib might just be the one for you. Parents felt like this was a very easy crib to set up. Without having a lot of extra features or moving parts, this crib was a breeze to put together. This crib was on the low end of the price range. If you are looking for a crib with a small budget, or maybe you just don't see the point in spending a lot on a crib, then the Ikea Sundvik Crib is worth a second look. The slats are thin. One parent commented that the slats make an extremely loud noise when her child kicks it. She also said that sometimes her baby wakes herself up just by rolling against the slat because of the noise that it makes when bumped. Apparently, as her child grew, her baby made a game out of kicking the slats to hear the sound that they make. What was fun for the baby, wasn't so fun for the mom. If you are liking a quiet bedroom for your baby, then you might want to think about if slat noise will bother you. How much noise is too much noise is a highly individual topic. This crib does take up a lot of space. But, that is the nature of standard baby cribs, so this is not a fault by any means of the manufacturer. Consider where you will be keeping your crib and measure out how much space you have. If you live in a tiny apartment, then space could be an issue, but if you have room, then space won't be as much of an issue. Also concerning space, this is not a crib where you will be able to store much underneath it. The space from the floor to the crib is only about 5 inches. The baby will be sleeping fairly close to the ground. Mattresses are generally sold separately, especially with standard type of cribs. This crib also does not come with a mattress. You will need to purchase one separately. One parent commented that the Ikea mattress that they sold separately was a bit too small. You won't want any gaps at all, or space between the crib and the mattress, so this could be a problem. Make sure before buying this crib, that you will be able to buy a mattress that fits snugly against the sides of this crib. This Ikea Sundvik Crib is a simple standard type of crib. It sets up easily and the price is low. If you are looking for a simple crib that you don't want to spend a weekend setting up, then this crib might be for you. Keep in mind, that standard cribs like this do take up a substantial amount of space. The overall look of this crib is clean, neat, and in my opinion, pretty. Standard cribs like this Ikea Sundvik Crib have an orderly appearance. There is definitely a reason that this type of crib has been around for generation after generation. I hope that my review of the Ikea Sundvik Crib helps you decide if this is the right crib for your little one.